What is it with kids and wanting to be a simple ghost for Halloween? The kids ghost costume has sure evolved from the days of an old sheet, and two cut out eye holes to something this cute! I saw something like this last Halloween and had to make it this year! 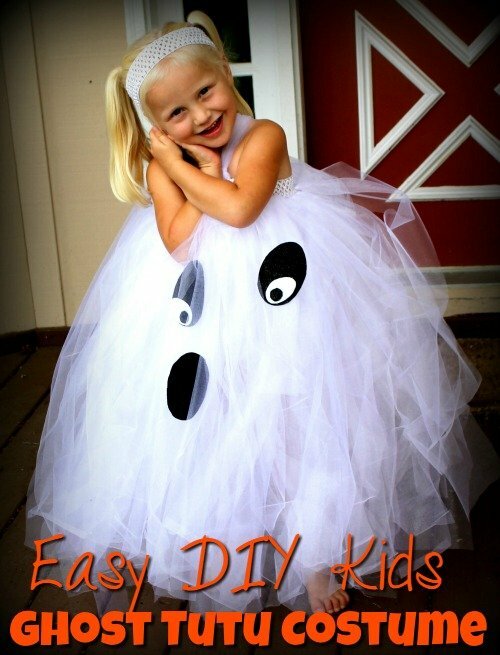 This is a super easy DIY kids ghost tutu costume. If you are looking for kids costumes, make sure to check out these 15 DIY Kids Costumes. But I also have costumes made out of everyday clothes, make sure to check out these 17 DIY Halloween Costumes as well! 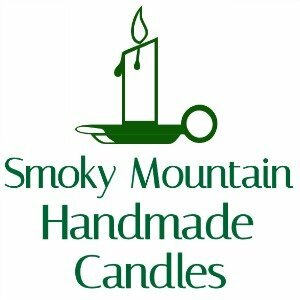 4 Inches White Satin Ribbon. Measure the child from chest to floor, double this number. 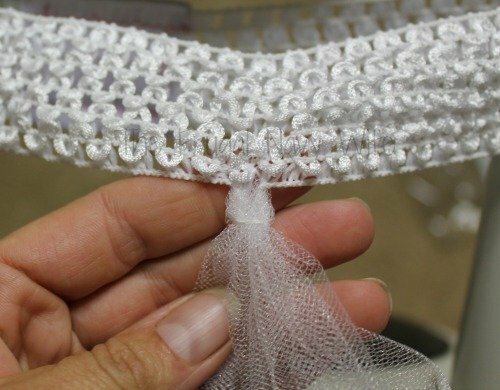 This will be the length of your strips of tule. For example; chest to the floor is 12 inches you want 24-inch-long strips 6 inches wide. The more strips you add, the fuller the tutu. I did about 40 strips for this tutu. Cut the strips and lay out. Measure the stretchy ribbon around your child’s upper chest. About arm-pit height. 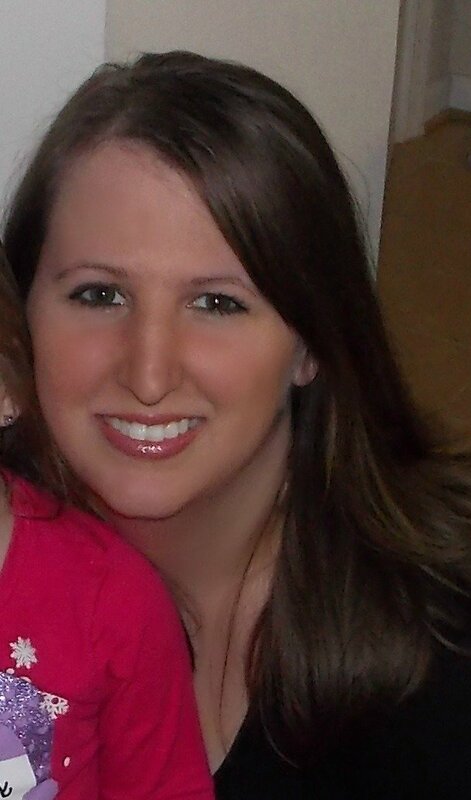 Cut to length. 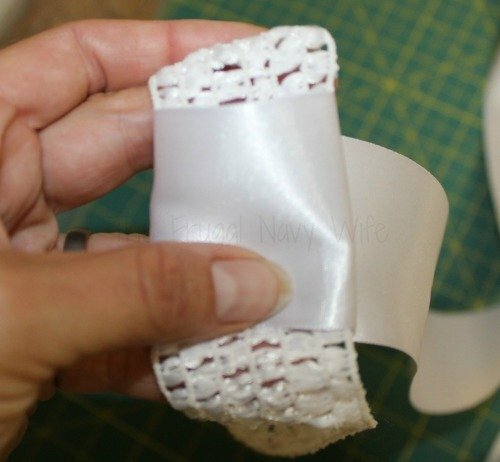 Wrap the satin ribbon around the stretchy ribbon to make a seam. The stretchy ribbon is impossible to sew. The satin makes a nice clean seam. I used a zig-zag stitch, but a strait would work fine. 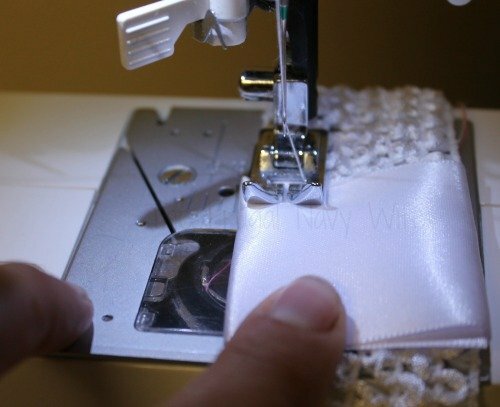 You can hand stitch this, and I have seen some people use hot glue, I find sewing works best. 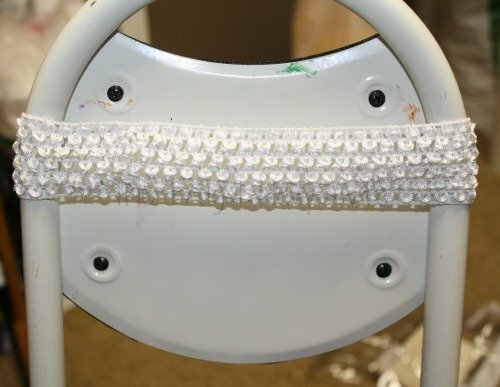 Stretch your ribbon circle around a chair back. 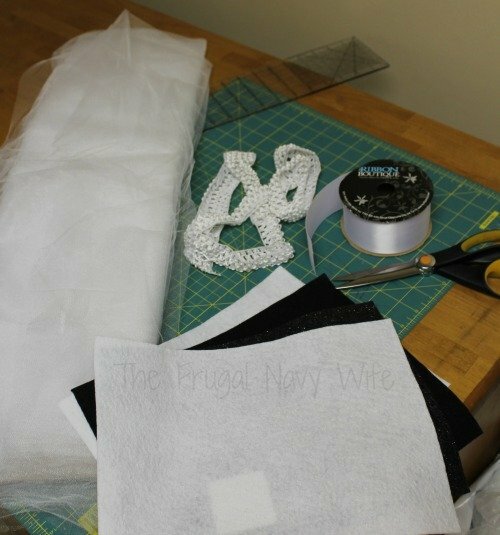 Using one strip of tulle, fold the tulle in ½ and push thru one hole of stretchy ribbon. 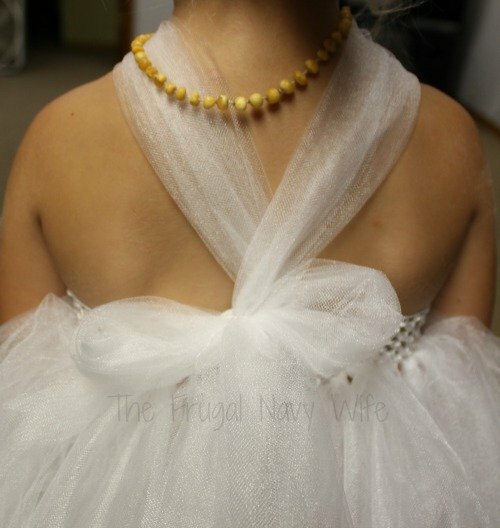 Open the top loop of the tulle and pull the tails thru. Work the knot tight. 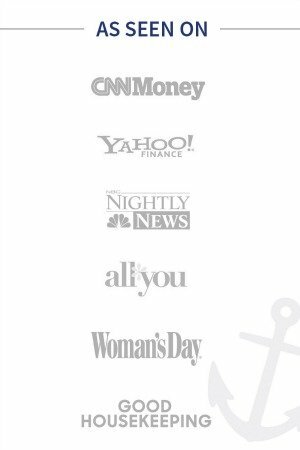 Repeat this around the entire circle of the stretchy ribbon. I put one tulle strip in each hole around the bottom of my stretchy ribbon. If you have extra, you can squeeze them in or start a new row. The more strips, the fuller the tutu. 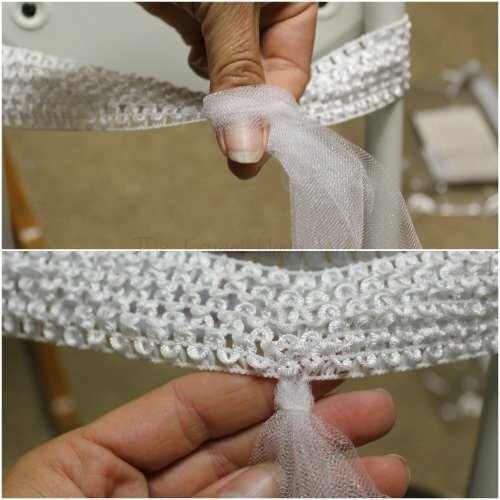 Save 2 strips of tulle to make the halter tie. Fold the two strips in ½ and tuck and pull in the top row centered in your child’s chest. You will have pulled thru 4 ends, separate, so you have 2 over each shoulder. Criss-cross and tuck and pull in the top row of the back of the stretchy ribbon. This will hold the tutu up and provide a way to tighten it if it is a bit loose. 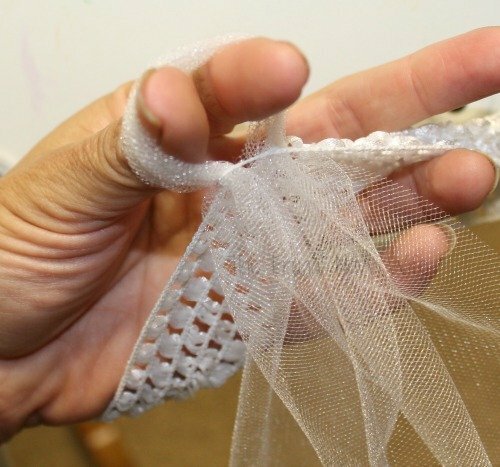 Tie the tulle in a bow. 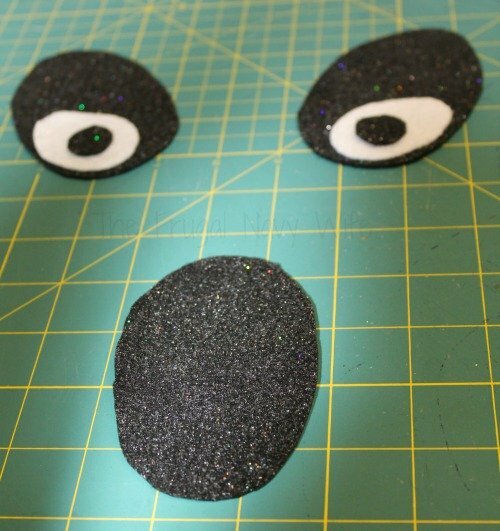 Cut out the eyes from the black felt. I like to do a few layers of black and white to make them look like “Real” eyes. Cut out a mouth. Then hand stitch the layers of eyes with black thread. Many people choose to hot glue these together. Center the eyes and mouth on the front of the tutu and hand stitch to one strip of tulle. I typically do not hot glue this layer because they do tend to fall off. Your ghost is now ready to spook! Thank you for your blog. It’s very helpful with my daughter’s got costume this year. I love the idea of using the crisscross to hold the fabric up!! I was just wondering how many yards of tulle (about) do you think you used to make her costume? It is adorable. Thank You so much for this awesome tutorial!!! Started it today!